Inertia (noun): A tendency to do nothing or remain unchanged. The tendency to sit tight isn’t always a bad thing when it comes to your finances. Take investing, for example: A set-it-and-forget-it (or, more accurately, a set-it-and-check-in-on-it-every-so-often) approach to the stocks you’re holding in your retirement account is almost always better than a reactionary one. But there are many other ways inertia can hurt you financially. Staying too long in a low-paying job, for instance, can mean losing out on earning potential. Failing to update (or create) your estate plan can backfire with disastrous results. And waiting to amp up your saving and investing? Well, that’s time you’ll never get back. So how do we break out of inertia? It starts with recognizing the fact that not doing something is itself an action and a choice — and every action has a consequence. Sometimes what keeps us stagnant is considering the cost, pain, or opportunity cost of doing something. But we don’t examine the flipside: The cost, pain or opportunity cost of not doing it. Here are three ways inertia hurts you big time — and how to get ahead of it. The Problem: Fighting inertia is by definition hard to do, particularly for people who like to have all the answers before they dive into something. But in the world of investing, there are no perfect answers — so it’s likely that you’ll never feel 100 percent ready. 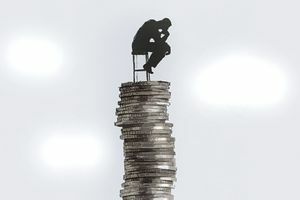 “One of the biggest mistakes people make is delaying putting their money to work” because they’re worried they’ll get it wrong and lose money, says Ken Hevert, senior vice president of retirement at Fidelity Investments. Is it the right time to invest? What if prices go down? What if I pick the wrong investments? These are all understandable — but unanswerable — questions. You’ll have wins and losses in the market, but only by being in it do you have a chance to get it more right than wrong. By contrast, if you’re stashing your money under the mattress or in a savings account, you’re already getting it wrong, as inflation means you’re losing money. The Fix: Dollar-cost averaging can help curb your fear. When you dollar-cost average, you’re putting your money in the market over time at regular intervals. Say you have $5,000 to invest: Instead of putting the full amount to work right away, you can deploy that $5,000 over a time period of weeks or months. It’s emotionally easier because you’re dipping a toe (and just part of your money) in the investing waters instead of diving right in. You’re also separating yourself from attempting trying to time the market, says Hevert. And you can further remove emotion from the equation by automating these deposits, so you don’t have to face the fear every time you invest part of the money. And the longer you stay in a situation like this, the harder it is to get out of. (Millennials, take note: It’s especially important to earn as much as you can in the early stages of your career, because all subsequent raises and boosts will generally be based on your previous salary.) Even if a potential new employer doesn’t know what you made at your last job, it will likely impact your own sense of what you can ask for. “If you don’t value your own worth, then why is someone going to pay you more money for it?” says Philbin. The Fix: You need to increase the value you see in yourself. One way to start is by tracking what you’re actually accomplishing at work. Look at the initial job description and your boss’s expectations, and compare them to feedback you’ve received and any concrete numbers demonstrating your performance (like sales or metrics). Gather all this in a folder titled “accomplishments” that you add to year-round. Then, use a site like PayScale to input your job title, duties, city and company size — it’ll give you the average salary for someone in a similar position. If you prefer to stay in your current job (or with your current company) ask for a review meeting, and present your case. If your company can’t offer the boost you’re looking for, it’s time to start looking for other opportunities. And when those opportunities turn into interviews, and they ask about your salary goals, your answer should be based on the research you’ve done on what your work is worth — not on your current salary. The Problem: No one likes to think about death. Only 44 percent of Americans have a will with instructions on handling their money and estate, according to a 2016 Gallup poll. The most-cited reason? “I just haven’t gotten around to it,” reports Caring.com. That’s inertia in a nutshell. But creating a will — plus a health care directive and power of attorney for finances, in case you’re incapacitated — is crucial. Without all of these things, the state may designate not just who receives your assets after death, but who will take care of your kids. A will is the only document that allows you to name guardians for minor children. The Fix: Make an actual appointment — block off time in your calendar — to get this done. If you’ve got a spouse, you’ve already got a partner to keep you to this. If you don’t, grab a friend without a will and have her do the same for her own calendar, so you can keep each other accountable. Then, for reference, make a list of what you own and how you own it, as well as a shortlist of people you’d trust to act on your behalf for financial and health care decisions. You can either create a DIY online will (Nolo.com’s WillMaker costs $55, and LegalZoom’s DIY wills start at $69) or pay a lawyer or estate-planning attorney to make one for you, starting at about $500. (An in-between: You could also pay a professional to look over your DIY will.) And Paul Jacobs, Chief Investment Officer of Palisades Hudson Financial Group, notes another peril of inertia: Failing to keep your estate plan updated. He suggests revisiting your plan every three to five years or so, or whenever your circumstances change significantly.